*All of the photos of this trip were taken by Don and Tess McDowell, Thanks!! Ah, another day on the trails. Since I had decided it would be best (had to work at 5:30am the next day) that I pick a trip where one- I would not break anything (had to tow the tent trailer home), and two- I didn't want to get back to camp too late. 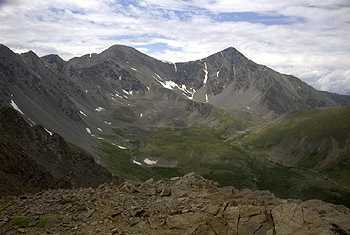 So I chose Don McDowell's trip up to Argentine Pass and the Santiago Mine just south of town. I also hadn't been up in the area for almost 20 years, so it was good to visit a 'new' area. Don led about 13 or so rigs out of camp thru Georgetown as I tail gunned. 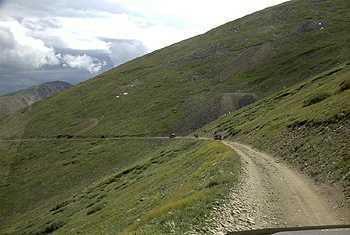 We trekked up the semi-paved Guenella Pass road, and off the pavement to the Forest Road to Waldorf. Following up the valley, we reached Waldorf for a break. 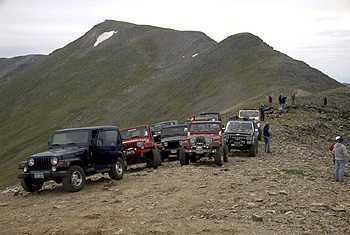 Just to the south, we trekked up a small shelf road up to 13,200' Argentine Pass. 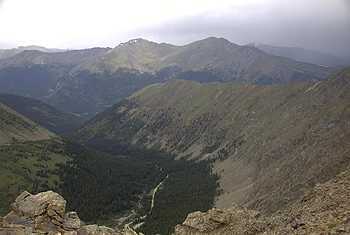 with views of to the west and Summit County. 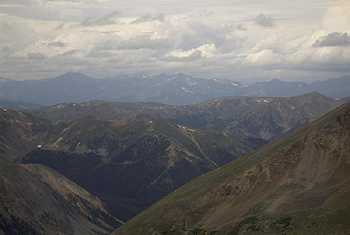 Once down off Argentine Pass, we headed to the Santiago Mine sitting about 12,000' just a few miles away for lunch. 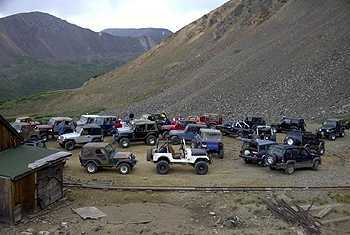 We met up with one of the Hoobs's groups finishing up their lunch at the mine. 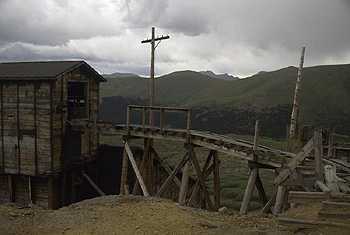 The Santiago Mine is one of the few remaining well preserved early 1900's mine left in the area. A simple walk around the inside gives one eire signs of a once noisy and busy place. Electricity was pumped to the mine, and some circuit breakers date back to the 30.
and it's well preserved trestle. With tummys full, we headed up to some more scenic views. Mother Nature had other ideas, as she tried to scare us off the mountain. 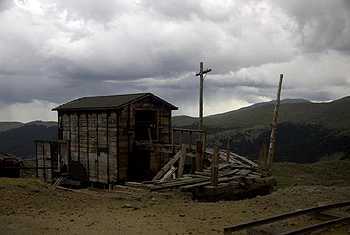 A rain squall began just as we headed out of the mine and into the unprotected tundra up to near Edwards Mountain. My Jeepin-sidekick took cover under the tonnau cover as we forged thru the rain. Just as fast as it came, it passed just in time for us to see great views of Gray's and Torreys Peaks as the sun came out. Watching the storms head NE from 13,000' was pretty cool. 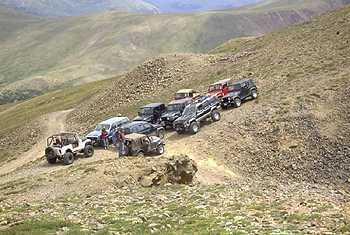 as we parked near 13,200'. As another storm was off to the west heading our way, it was time to get off the mountain, and back to the shelter of the trees. We headed back down, and as we made it down the last section of trail, it started pouring again! The roads were not dusty now. A great trip, with fun people and excellent rocky mountain scenery! Back down in Georgetown, everyone got ready for 'Door Prize Night'. I got air and gas, then loaded the tent trailer on to the Jeep for the drive home.